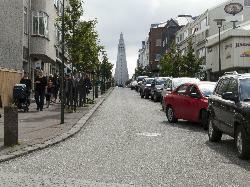 Hallgrimskirkja (Hallgrim's Church) in Reykjavik. 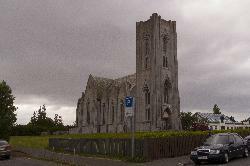 At 74.5 metres (244 ft) high, it is the largest church in Iceland and among the tallest structures in Iceland. Designed to resemble the basalt lava flows of Iceland's landscape. 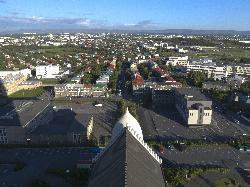 View of Reykjavik as taken from the Hallgrímskirkja church. Viewing the north east quadrant of the city. View of Reykjavik as taken from the Hallgrímskirkja church. Viewing the south west quadrant of the city. View of Reykjavik as taken from the Hallgrímskirkja church. Viewing the south east quadrant of the city. 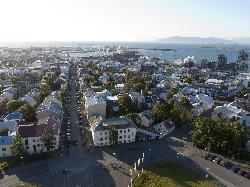 View of Reykjavik as taken from the Hallgrímskirkja church. Viewing the north west quadrant of the city. 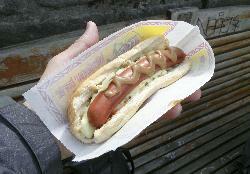 Photo of Icelandic Hot Dog from vendor in downtown Reykjavik, Iceland. from site: Icelanders are nearly fanatical about their hot dogs, and once you taste one, it’s easy to see why. The hot dogs are made mostly with lamb (and sometimes with a little pork) and traditionally topped with mustard, ketchup, fried onion, raw onion and remolaði, a mayonnaise-based sauce with sweet relish. And in a country known for being exorbitantly expensive, they are a delightfully low cost way to fill up and try a local specialty. View of Hallgrims Church up the hill of the street Skolavordustigur. 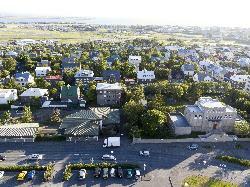 Located in Reykjavik Iceland. 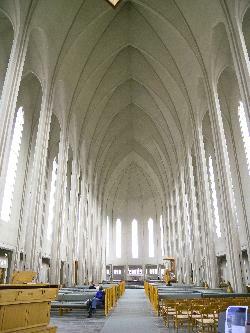 Photo of the interior of Hallgrimskirkja (Hallgrims Church) in Reykjavik Iceland. Timeline of all skyscrapers holding the title of tallest building in the world, from 1890 to present. Seems to be the official web site for the country of Iceland. 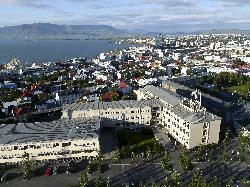 Useful site to find more information about Iceland. Lonely Planet has offices in Melbourne, London and Oakland, with over 500 staff members and 300 authors. Wikipedia links of National Parks in Iceland. from site: It's been an exceptional time for tourism in Iceland, with annual estimated figures showing a about 20% increase in the number of visitors over the last few years, the majority of whom also visit Reykjavík. This increase, especially in the off-season, has been met with both enthusiasm and innovation in the city as local institutions and businesses come together to serve this growing sector and to create new and exciting ways to entertain and engage visitors to the city.